The Indonesian Academy of Sciences (Akademi Ilmu Pengetahun Indonesia, AIPI) has initiated an activity to produce an Indonesian Science Agenda (ISA), by a network of young Indonesian scientists, former participants of the annual Indonesian-American Kavli Frontiers of Science (KFoS) symposia. 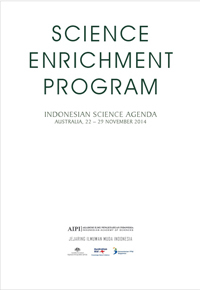 The Science Agenda, proposed to be in the form of 45 Crucial Scientific Questions for the Future of Indonesia, is a list of fundamental scientific questions of strategic importance in relation to major challenges faced by Indonesia today; the solutions should make significant impact in meeting the challenges and in advancing science in Indonesia, with a time frame towards the centenary of Indonesian independence in 2045. As the initiative progressed to the second order draft stage, it was realized that there is a serious need to enrich the scientific content of the agenda by means of thorough discussion with experts in various fields. I am pleased to acknowledge the strong commitment of Knowledge Sector Initiative of the Australian Department of Foreign Affairs and Trade (KSI DFAT) to support this activity through the funding of Science Enrichment Program. Hence, twenty three people as part of the initiative—5 members of the Study Committee (consisting of 12 Indonesian young scientists and 3 AIPI members in advisory capacity) and 7 staffs of the Study Committee including Study Director, Editor, and Writer and Communication Officer and one representative from Bappenas, visited Australia for a week on 22–29 November 2014. The purpose of the visit was to have series of in-depth discussions with Australian leading scientists in order to enrich the scientific visions of the Science Agenda, as well as building the capacity of ISA supporting staff to enable them to write similar reports in the future. In particular, the Study Committee were seeking ways to enrich the scientific content of the Second Order Draft of the Agenda through visits to top Australian scientific institutions. Several research and academic institutions in five Australian cities i.e. Canberra, Sydney, Hobart, and Melbourne were visited. The invaluable contribution and warm discussion from the hosts of this program including the Australian Academy of Sciences (AAS), Commonwealth Scientific and Industrial Research Organisation (CSIRO), Academy of Technological Sciences and Engineering (ATSE), University of Melbourne, and Monash University deserve our appreciation. Thus, we are delighted to present this book in order to share our wonderful and enhancing experience during the Science Enrichment Program to Australia.